Going into the film, I wasn't sure what to expect based on the trailer, but I guess it wasn't roller skating or people quacking like ducks. 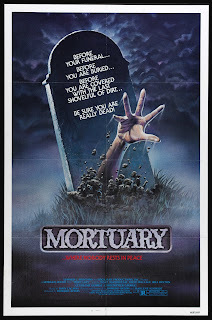 The trailer may be misleading (okay, it's blatantly misleading about the actual film), but Mortuary actually has plenty going for it in its own right. After Christy (Mary McDonough)'s father , Dr. Parson (Danny Rogers) dies in a pool related "accident," she's prone to nightmares and spells of sleepwalking. Her boyfriend Greg (David Wallace) and his pal Josh (Denis Mandel) are dropping by the warehouse of a mortuary Josh used to work for, when they discover the mortician, Harry Andrews (Christopher George) holding a seance with a woman that appears to be Christy's mother (Linda Day George). The guys are separated, and just as Josh finds what appears to be the body of Mrs. Andrews, he's killed by a mysterious figure in a cape. Greg arrives in time to see someone speeding off in his van, and he and Christy set off to discover what happened to her father, Josh, and what the behind all of these clandestine activities. Is Christy losing her mind? Are Mrs. Parson and Mr. Andrews scheming behind her back? And who is the stranger terrorizing them in the night? Mortuary is a pretty straight forward mystery with some clever twists and turns. After a slasher-like set up, the film shifts between Greg's attempts to find Josh and Christy's delicate grip on reality. Is she really being followed at night, or are they part of her walking nightmares? Did Josh really leave to join the Navy (okay, no; we see him die), or is Mr. Andrews colluding with the Sheriff (Bill Conklin) to railroad Greg? And what about Paul Andrews (Bill Paxton), Harry's well-meaning, if slightly loopy son? He has a crush on Christy, but his innocent flirtation and awkward social stylings don't seem to be doing him any favors. Even if you've already figured out who the killer is (and it won't be hard about an hour in when they pretty much tell you), Mortuary finds other ways to misdirect you and keep you invested in the mystery for 87 minutes. Just when you think you have it figured out, a revelation shifts your perspective on motives and leads you in a different direction, which I always appreciate. It offsets the slow chase scenes and overlong game of cat-and-mouse towards the end. At the risk of spoiling too much, I'll say the ending is an interesting variation on Psycho, but with a final shot that you might not see coming, even though they set it up briefly. I'd like to highlight a young Bill Paxton, who nearly steals the show as the awkward Paul Andrews, a guy who doesn't know much about other people but is an ace around the dead. He's endearing, a little off-putting, and just "off" enough to keep you watching, even when the pace gets a bit sluggish. Was I a little disappointed that Mortuary isn't at all like its trailer? Well, yeah. It wasn't the movie I was hoping to see; the one I was promised. On the other hand, Mortuary is still a fun movie from the early 1980s with a more sophisticated plot than many of its contemporaries. The gore is sparing, the body count not high, and the gratudity is pretty limited for 1983, but what is there makes sense in the story. While not exactly what I wanted, I'm happy to say that Mortuary still delivers in its own way.